An extraordinary transformation of brilliance and colour transpires in the alpine as the mountains change from summer to fall. Join us at 9 AM, September 26, and experience this visual feast from one of the best and most accessible places: the summit ridges at Panorama Mountain Resort. This catered excursion will see guests ride three chairlifts in order to access the summit. Once at the resort’s upper regions, guests will be chaperoned to one of three select vantage points with spectacular vistas of fall colours. After rambles on the ridge, guests will then descend via the chairlifts to the resort for drinks and entertainment. 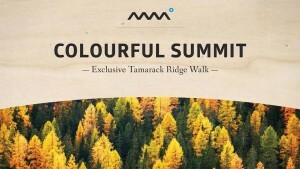 Join us for our inaugural Tamarack Ridge Walk. 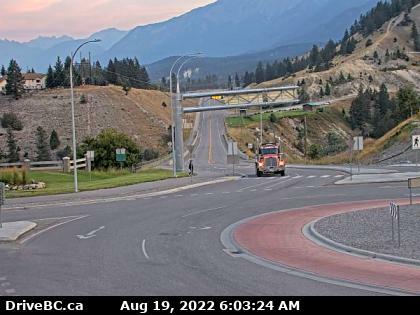 This will be the first time ever we are giving guests the opportunity to ride all three chairlifts to the summit while not in winter. You will also get to download the Champagne Express chairlift and the Mile 1 Express! Located between MT. Goldie and Taynton Bowl. 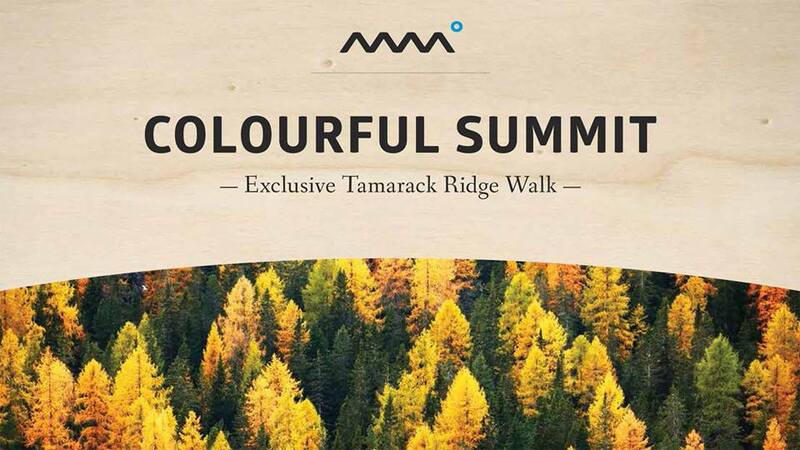 Enjoy stunning views into Taynton Bowl as you walk among the Tamaracks. See Panorama’s most epic ski trails in the Taynton Bowl as you never have before. While group one veers left to the plateau you can continue your walk further toward Mt Goldie veering off to the right as you make your way down to an tarn (a mountain lake or pool) surrounded by Tamaracks. Take in the views up to Mt. Goldie, over to the Cannery Chutes and down to Hopeful Creek. This trip is a little longer and involves more ups and downs. Getting a bump up the mountain on the chairlifts is awesome, but to ascend Mt. Goldie you will be required to work a little. Be prepared for the furthest walk and scramble up a shale field to the ridge of Mt Goldie and you will be rewarded with the best views of all. Look down towards Lake Windermere, East Fork valley, the tarn and Mt. Brewer. 1:30 pm – Have your packed lunch at your walk destination. 2:00 pm – Begin your return trip to the summit of Panorama and then down the Get Me Down ski trail to the top of the Champagne Express. 4:00 pm – Download on the Champagne Express & Mile 1 Express. 4:50 pm – Once back at the village head to the T-Bar to have your included drink and talk about what an awesome day it was!